Today is a good day to work out what and how you will read the Bible in 2010. I suggest heading over to this website and choosing one of their plans. I got there from John Piper's church website where he recommends one of them for his congregation members. But I think all would be good depending on what you want to achieve! I'm going to be using the Discipleship Journal Reading Plan over the coming year. If you pick one from ESV you can get lots of nice extras like having them all on one webpage, RSS feed,delivered by email, as a iCal calendar import etc... and you can integrate them nicely into whatever website you want. I like that one, but I get hopelessly distracted by computers, so I like to have something in a paper bible with a paper journal next to me. So that's why I go with the old school style. Of course, there is also the ANGLICAN LECTIONARY. A good place to start for an ANGLICAN!!! Even though I've always gone to an Anglican church, I've never actually used the Lectionary for anything. Even our preaching program doesn't come out of it. I wouldn't even know where to find out what it says. The Anglican Lectionary is great, but only available in one form - in a large printed booklet. If they liberated the lectionary so we could enjoy it electronically or in a booklet that fit inside a bible then I would have used it. Chris said "Even though I've always gone to an Anglican church, I've never actually used the Lectionary for anything. Even our preaching program doesn't come out of it. I wouldn't even know where to find out what it says." Well I wouldn't appeal to being a prayerbook Anglican then. You may as well be Pentecostal. Again, I think naming yourself would be good seeing as your starting to accuse me of all sorts of things. I think it's a big jump to say just because I've not had much experience with the Lectionary then I have no grounds to appeal to being a prayerbook Anglican and am basically a Pentecostal. I think you should read my post about straw men arguments, because I'm not sure how that logic follows. Firstly, I'm assuming you consider yourself to be a prayerbook Anglican. What does that mean for you? What are your criteria for prayerbook Anglicanism? My feeling is that being a prayerbook Anglican probably has more to do with the theology and ideals behind the prayerbook than the actual book itself, or use of it. I must also admit that the term "prayerbook Anglican" isn't one I'm really excited by. Having said that I do feel a certain loyalty to the Anglican church. Also, I'm about to get married using a prayerbook service, so that's pretty Anglican of me! I must get a few ticks in the prayerbook category! On your other point, "You may as well be Pentecostal", There are more types of people in the world than Pentecostal and Prayerbook Anglican. Speaking as an Anglican minister I haven't always found the Lectionary to be helpful in working through the Bible in a consistent careful way. This could be that it's put together by more "progressive" types and I've yet to find a more 'fundamentalist' edition. So Luke do you still think you can claim to be an Anglican? What is the nature or essence of Anglicanism for you? Sola scriptura = by scripture alone. lets not do a hebrew move on the word and surround the word behind our ideas. But Ive not read it im not Anglican. Im sure its good and helps some but God does speak for himself. 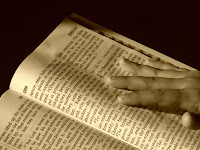 Let us read and find out who God really is and then we'll fall in love with him and learn the value of a human soul. lets not be quick to condemn those who worship not with us. Many a man has died because when God spoke they said heresy and missed His heavenly glory. The spirit has come to show us unto ALL truth. Just the truth about Jesus.